Just in time for Valentine’s Day, this decadent layer cake is the perfect way to spoil someone special. 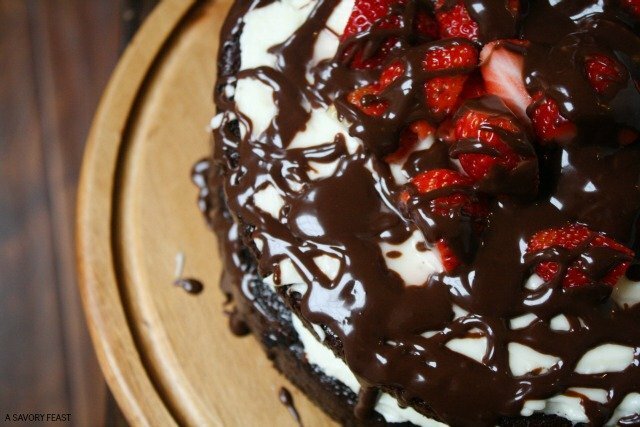 Layers of homemade chocolate cake and cheesecake frosting are topped with fresh strawberries and a rich chocolate ganache drizzle. If you’re a regular reader here at A Savory Feast, you know recipes like this aren’t the norm! I usually eat a fairly healthy diet, but I’ve got such a sweet tooth. Lately I keep seeing all these gorgeous layer cakes on Pinterest, and I’ve been dying to make one myself! I decided that needing a Valentine’s Day recipe for the blog was excuse enough, and this cake was the result! This time of year I always crave strawberries like crazy. When I was a kid, I used to go strawberry picking with my cousins and then my mom and I would make strawberry jam and all sorts of strawberry desserts. It’s also getting close to Strawberry Festival season here in Florida. Andrew and I have been going the past couple of years, and our absolute favorite thing to get is a donut from the Amish Baking Company covered in strawberries. It’s the main reason we go! Anyway, let’s talk about this cake. It’s really a bummer that my site doesn’t have a feature to let you taste this cake! When people find out I’m a food blogger, one of the first questions they ask is “what’s the best thing you’ve ever made?” It’s no competition, this cake has just stolen that spot! If you are looking for a way to really impress and spoil your Valentine this year, this is it! 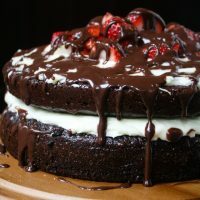 Not only is this cake over-the-top fancy with it’s bright red strawberries and rich chocolate ganache drizzles, it’s taste is to die for, too. You start by making two moist chocolate cakes from scratch (don’t worry, it’s way easier than you think!). Stack them up with layers of cheesecake frosting and pile the top with fresh strawberries. The chocolate ganache is made with just two ingredients and then drizzled all over the cake for a beautiful finishing touch. Don’t let this cake intimidate you! Even though it’s completely made from scratch, it’s really not that hard to make. It’s a little time consuming, but I think you’ll agree it was well worth it. 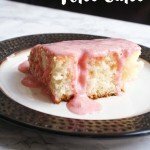 Whether you have plans to visit a nice restaurant for Valentine’s Day or stay at home and cook a special meal, this cake is the perfect thing for dessert! If you enjoy this recipe, be sure to subscribe to A Savory Feast for new recipes each week, plus a free meal planning printable kit! Just in time for Valentine's Day, this decadent layer cake is the perfect way to spoil someone special. Layers of homemade chocolate cake and cheesecake frosting are topped with fresh strawberries and a rich chocolate ganache drizzle. Preheat oven to 350 F. Grease and flour or use cooking spray on two 8" or 9" round baking pans. In a large mixing bowl, combine the sugar, flour, cocoa powder, baking powder, baking soda and salt. Make a well in the middle of the dry ingredient mixture and add in the eggs, milk, vegetable oil and vanilla extract. Beat for 2 minutes at medium speed, then stir in the boiling water. Divide the cake batter evenly into the prepared cake pans. Bake for 30-35 minutes or until a toothpick comes out clean. Let the cakes cool in the pans for 10 minutes, then flip them out onto a wire rack and let cool completely before continuing with assembling the cake. Beat butter and cream cheese for 3 minutes until fluffy. Mix in vanilla, powdered sugar and milk and beat for another 3-5 minutes. Pour the heavy cream into a small saucepan and bring to a simmer. While the cream is heating up, put the dark chocolate chips in a small glass bowl. Once the cream is simmering, pour it over the chocolate chips. Mix until smooth and let cool and thicken until about room temperature. Place one of the chocolate cakes on a cake stand or serving dish. Spread about half of the frosting over the top of the cake. Place the second cake on top of your frosting layer and spread the remaining frosting over the top. 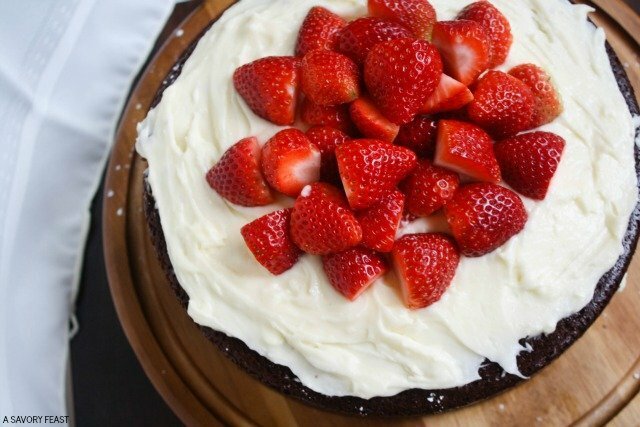 Arrange the strawberries in the center of the top of the cake. 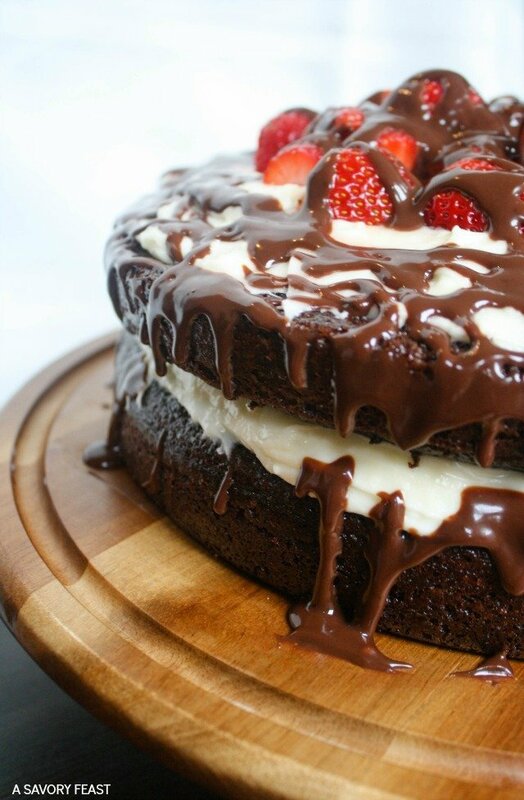 Use a spoon to drizzle the ganache over the strawberries and down the sides of the cake. Keep the cake in the refrigerator until you are ready to serve. What are your plans for Valentine’s Day? It’s worth every calorie, I promise! Oh ganache, yes! 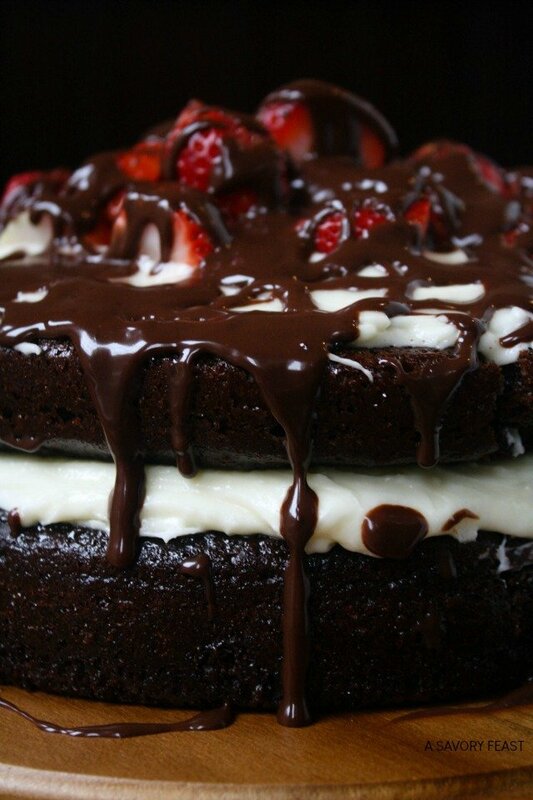 I love the chocolate and strawberry pairing, and your cake looks decadent. I also love the “dark and moody” photo! Thanks Joanna! I had so much fun making this cake and taking the pictures. And of course, eating it! Oh my word, YESSSSS! 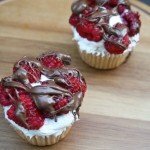 I’ve got a major sweet tooth, and when you combine chocolate and strawberries in any dessert, I’m SO in! Pinning this to my Valentine’s board for inspiration. You know, since we’ll definitely be spending our Valentine’s Day in this year! Thanks for sharing this, lady! You HAVE to make this cake! I I promise, it’s soooo worth it. This is so so so beautiful!! I love ganache cakes– saving this recipe for sure! You won’t believe how easy it is to make the ganache drizzle from scratch! You definitely need to make this cake. Oh my word — I am so impressed with how this turned out! My mouth is watering just looking at it. I hope you enjoyed it after all the photos were taken! Thank you! It was soooo good. Andrew and I keep talking about it! I’m already planning to make another one later this week. This cake is stunning Jenna!! I am drooling over here, just beautiful! Thank you, Annie! I was so happy with how it turned out. Oh I wish that you did have a taste feature!! 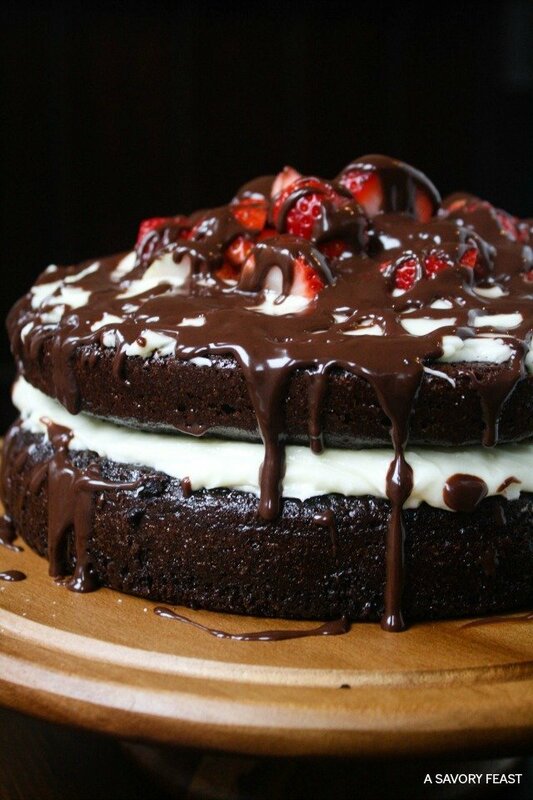 This cake looks divine!!! It was incredible! I’m already going to make more tomorrow. YUM! I”m getting ready to work on something similar today. Gorgeous! Believe me, it tastes even better than it looks! I’ve already gotten requests to make more this weekend. I’m so excited to eat it again! This definitely looks decadent! Perfect for Valentine’s Day. Thank you for the recipe. Thanks Kati! I’ve already had so many requests for it, I’m making another one as I type this. 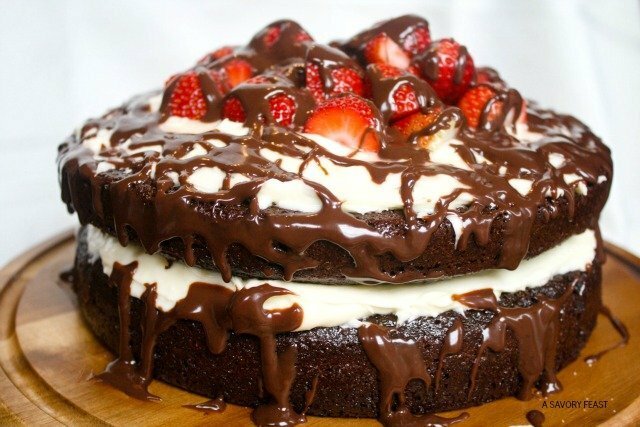 Chocolate and strawberries is such a wonderful combination, this cake looks amazing! We have to wait until June for strawberry season here in New England so I will try not to be jealous that yours is just around the corner 🙂 Thanks for sharing at What’d You Do This Weekend?! 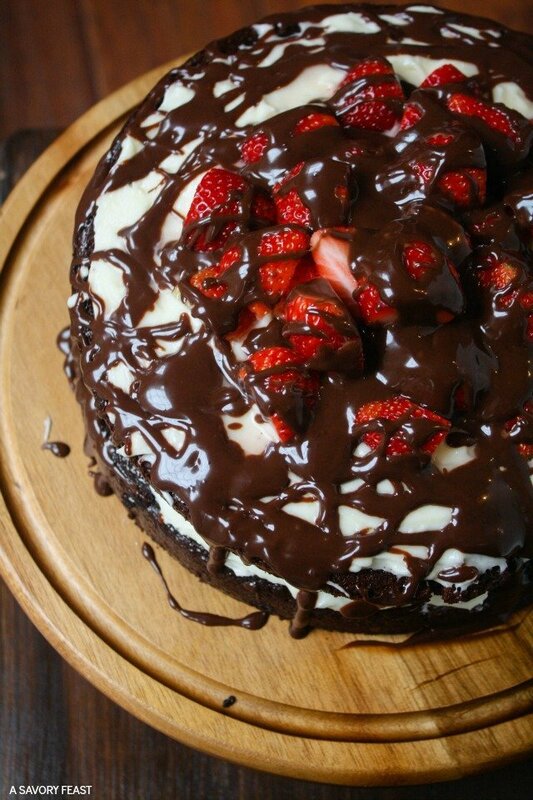 I just LOVE chocolate and strawberries together. They were the perfect combination for this cake! These looks amazing! Thank you for liking up to this week’s Tasty Tuesday linky! I have pinned your recipes to the Creative K Tasty Tusday Pinterest board. I hope that you come back again on Tuesday. Thanks for hosting the party and for stopping by! It was SO SO SO good! I already had to make another one this past weekend because everyone wanted to try it. I’m sure it will be a regular for me! This cake is just beautiful! Thank you so much for sharing with us for our 5th Anniversary of Full Plate Thursday! Hope you have a fantastic week and hope to see you again real soon! Thank you for stopping by, Miz Helen! Have a great week. I had been wanting to make a layer cake for the longest time! It was so much fun and SO delicious! This literally looks AMAZING! Thanks so much for linking up with The Alder Collective! I’m choosing this for my feature this week! Aww thank you, Kelsie! This cake was so much fun to make and even more fun to eat. I’m excited it’s being featured this week! 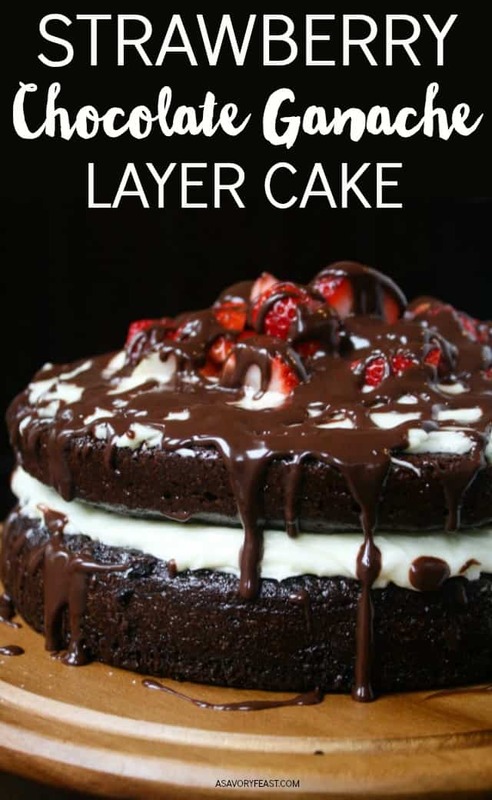 Your recipe for Strawberry Chocolate Ganache Layer Cake is featured on Full Plate Thursday this week. Hope you have a great Valentine Weekend and come back to see us real soon! Thank you, Miz Helen! 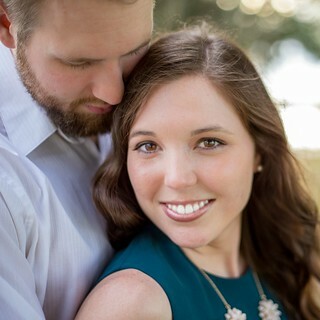 I’m so excited to be featured this week. I haven’t tried that personally, but I’m sure it would work great! Oh heavens, that looks amazing! Just give me a fork, a pot of coffe and leave me alone for the day and I’d be in heaven 😉 Thanks for sharing at Throwback Thursday! That sounds like the perfect day! Thanks for stopping by. This looks SO unbelievably good!! My best friend and I made a similar cake once, but it had three layers and huge chunks of strawberries in the middle of each layer. Needless to say… that was one leaning tower that did not survive haha. It was for a birthday party and we had to transport it there and I was sitting in the passenger seat literally holding the cake upright… to no avail! We were laughing so hard I honestly thought I might pee myself, and thinking of it now still makes me giggle. Anyway, your version looks 10x safer and just as delicious. I’m traveling full time at the moment and still have about four months of my trip. But it’s posts like these that make me so excited to get back in a kitchen!! That story is hilarious! This version is definitely much easier to transport and serve. I had contemplated adding strawberries between the layers as well, but now I’m glad I didn’t! Decadent is the right word, that is for sure! This cake is so rich and delicious. You will love it! This recipe is perfect for strawberry season. Definitely! I’m wanting to make another one soon. I just need a good excuse! My mouth is watering! This looks SO delicious! This cake is just wonderful! You’ve got to try making it soon. 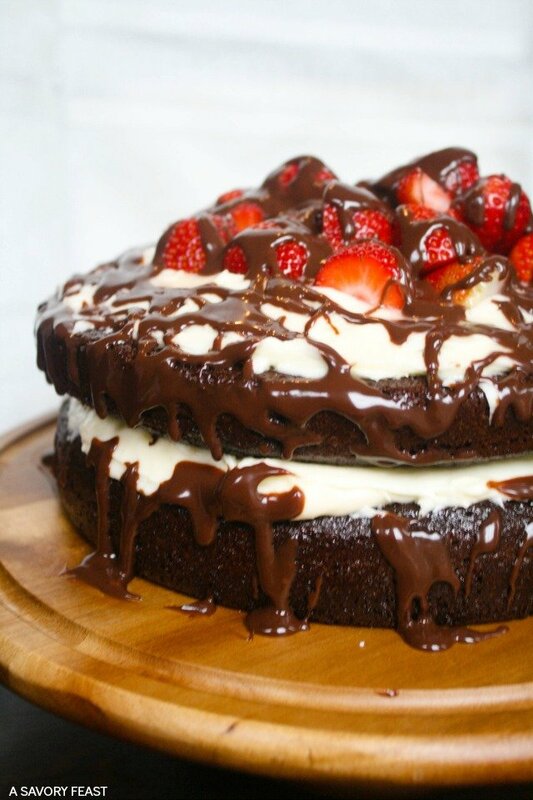 Seriously, this looks so good and it does not help that we love chocolate and strawberries. This sounds like the cake for you! Enjoy. I always use regular (not low fat) cream cheese. 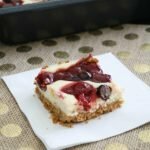 I’ve made this with both Philadelphia brand as well as Winn-Dixie store brand and it turns out great both ways. I'm Jenna. Food is my love language! 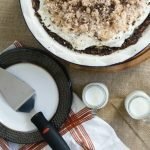 I'm here to share delicious recipes to help you feed your family and friends. All photographs and content were created by Jenna Owens of A Savory Feast unless otherwise specified. My work may not be used without my express permission. Some posts have been sponsored. Regardless, I only share products I have actually used and loved! I occasionally share affiliate links in my posts. If you make a purchase through these links, I will receive a commission at no extra cost to you.